The SmartLink Micro Analog Telephone Adapter provides connectivity for analog phones and faxes to a home, home office or corporate LAN. Connecting to any analog phone, fax or PBX, the SmartLink product is ay cost effective solution for small offices and telecommuters to access Internet-based telephone services and corporate intranet systems across established LAN and Internet connections like xDSL and cable modems. 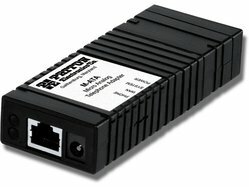 The M-ATA provides one Ethernet (RJ-45) port and one FXS (RJ-11) analog phone port for quick and easy interconnection to the local LAN. LEDs show at-a-glance the status of the system, LAN, WAN, and phone ports. A full suite of IP features (DHCP, NAT/PAT) are available to maximize universal connectivity. VLAN tagging and prioritization enables voice traffic to be handled before data traffic insuring higher quality voice calls. Support for PPPoE tunneling simplifies extending corporate intranet services to telecommuters. The user friendly web interface offers two levels of configuration; level one covers basic subscriber specific parameters, level two offers advanced settings for the transport network. Configuration and firmware can be downloaded from a centralized TFTP or HTTP server. The M-ATA is SIP and MGCP standard compliant. Analog phones attached to the SmartLink can use advanced calling features such as call forwarding, caller ID, 3-way calling, call holding, call retrieval and call transfer. Patton's Micro Analog Telephone Adapter provides seamless access to Internet telephony and data services. 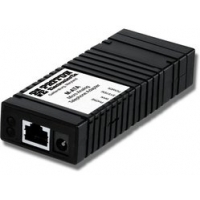 The M-ATA connects to any broadband access provider via a cable or xDSL modem.